Today we start a series of articles about Women in Martial Arts by Katalin Rodriguez Ogren. A conversation about the state of women in the sport of mixed martial arts should begin with a glance back at two combative sports with a long history: boxing and wrestling. Although women’s boxing first appeared in the Olympic games as a demonstration in 1904, it really took the entire 20th Century for it to gain acceptance within the athletic community. Despite strong social stereotypes and traditional points of views on the role women should have within our society, female fighters have been given several venues to showcase their skills, but lacked a fan base. 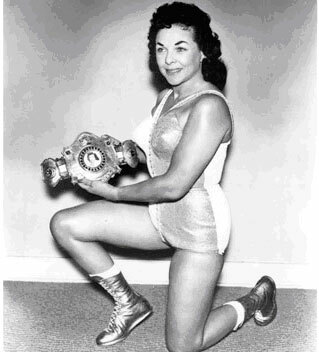 Although organizations like The Swedish Amateur Boxing Association and The National Wrestling Alliance provided opportunities to see women part-take in the combative sports, a couple of women are worth mentioning that served as pioneers. Boxer Barbara Buttrick, “The Mighty Atom of the Ring” and wrestler, Mary Lillian Ellison, ‘The Fabulous Moolah’ made their combative ambitions known in 1950s. Buttrick, an English born fighter that stood 4’11 and 98 pounds, had a left jab with knock-out power. She received notoriety in several European publications and was considered quite formidable. Buttrick eventually landed herself in Miami’s famous 5th Street Gym where she finished out her career, but saw so many of her desires suppressed.